Spectacular modern style villa finished to the highest standards and equipped with many extras, facing south and located only 2 km away from the center of Moraira. The accommodation has easy access, is all on 1 level and comprises of the entrance hall, spacious and bright open plan living space with lounge, dining, luxury kitchen, master bedroom with en-suite bathroom, 2nd and 3rd bedroom, family bathroom and ample covered terracing. The underbuild houses a large garage, laundry space, utility room and store room. 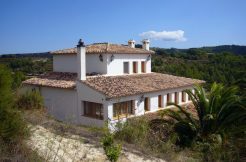 Outside ample terracing, an 8x4m pool, summer kitchen, irrigation system for the garden, automatic entrance gate, large drive, exterior shower / toilet and solarium with lovely open views.